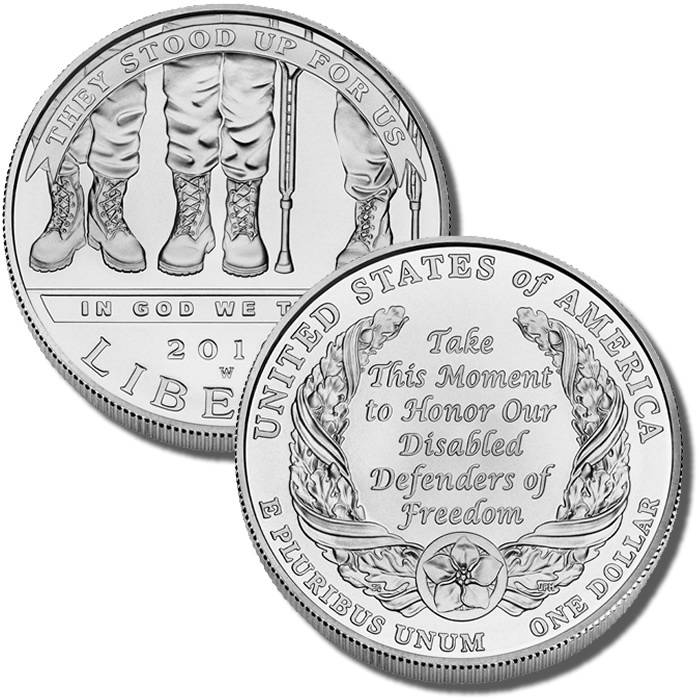 The 2010 American Veterans Disabled for Life Uncirculated Silver Dollar marks the first uncirculated commemorative released by the US Mint in 2010. Featured on the coins are designs which honor men and women who were disabled for life as a result of injuries received while serving in one of the armed forces of the United States. This includes those who are forced to live each day with those disabilities, those who died as a result of the disability causing injury, and those who survived the initial injury but later passed away. A surcharge on the sale of each coin was collected by the US Mint to be forwarded to the Disabled Veterans’ LIFE Memorial Foundation to construct the American Veterans Disabled for Life Memorial in Washington, D.C.
Each commemorative coin is considered legal tender and thus has a face value, but the Mint does not strike the coins for circulation. Rather, the coins are struck for their numismatic qualities and are collected by individuals as such. A surcharge is collected by the Mint on each initial sale with proceeds of the surcharge forwarded to an organization dictated by the law which authorizes each coin. Struck to uncirculated condition, each Disabled for Life Coin is composed of 90% silver and 10% copper. 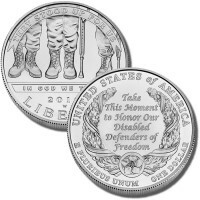 The 2010 American Veterans Disabled for Life Uncirculated Silver Dollar was released for sale by the US Mint on February 25, 2010. The Mint offered the Uncirculated Disabled for Life Coin at an initial introductory price of $33.95 for several weeks before changing to the normal price of $35.95. A "W" mintmark seen on each of these coins indicates it was struck at the US Mint’s facility in West Point.